Applications for marriage, death, and birth records are available online via the Oscoda County Clerk website. All applications should be mailed to Oscoda County Clerk, PO Box 399, Mio, MI., 48647, along with a check or money order to cover the $10 per name search fee. Genealogy research is permitted at the County Clerk office, as well, for one researcher at a time. The office is open during the business week from 8:30AM till 4:30PM, but is closed from 12 noon until 1:00PM every day for the lunch hour. Marriage, divorce, birth, and death records are indexed beginning at approximately 1880, and all except birth records are fully open to the public. 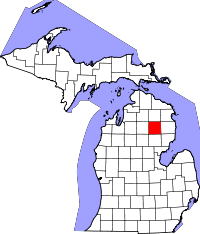 Oscoda County, one of many counties in Michigan named after words the mid 19th century scholar Henry Schoolcraft coined, was founded in 1840. It is located towards the northern tip of the bottom half of the state.